You are here: Home / About the Kubb World Championship / What is Kubb? Kubb is a very old game. “Throwing logs” is quite popular in Sweden now, particularly on the island Gotland. 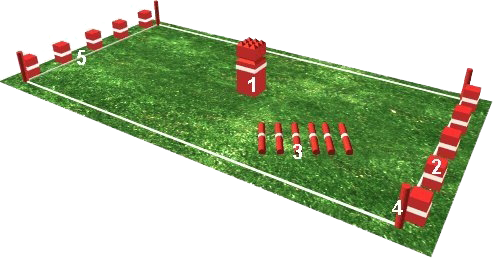 Kubb is a “partygame” which is played outdoors with 2-12 participants. Everyone can participate, young as old. The game is played on a field which is 5×8 meters, the size can be less or more depending on the skills of the players. The field should be fairly smooth and flat, usually we play on grass but gravel, flat rock or snow could also do. 1 KING approx. 9×9 cm square and 30 cm´s height. 10 KUBBS approx. 7×7 cm square and 15 cm´s height. 6 THROWING BATONS, round 44 mm in diameter and 30 cm´s in length. 4 CORNER STICKS and 2 MIDDLE STICKS 2x2x30 cm are also useful to have. The players are divided in two teams and take place behind their respectably baseline. The game’s aime is to knock down the kubbs of the other team with the throwing batons according to the rules. When all the kubbs are knocked down, the king should be knocked down, the team which does this has won. Since 1995 “VM i Kubb” (“World championship of Kubb”) is arranged on Rone IP (Gotland), 2004 there was 168 teams (of 6 members) in the competition from 8 different nations, playing mixed men, women and children.